A symposium on the role of digital technologies in architectural education and practice. How can the profession of architecture evolve and adapt to a constantly shifting technological landscape? How can architecture schools take on a more proactive leadership role within the discipline? How can they develop curricular initiatives that fully engage with the dramatic transformations occurring in practice? This three-day symposium will pose these questions and explore alternative professional and curricular approaches to incorporating digital technologies in architectural design. Invited participants active in both practice and academia will present case studies demonstrating innovative use of digital technology in realms of design, collaboration, fabrication, and construction. 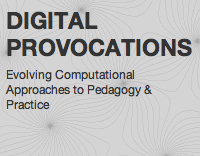 Visit the Digital Provocations site or contact Adam Marcus for additional information.